* Size - Bar measures 5mm x 31mm. * Materials - Available in sterling silver, rose gold or yellow gold. * Fonts - 3 Fonts Available (Modern, Typewriter and Block) as well as Greek letters. * The inscription can be darkened (3rd picture) or left plain (1st & 2nd pictures). * Finish - Bar is slightly hammered on the edges. 1. Please choose your metal option and necklace length from the 1st drop down menu. * Note: All necklaces will include a 1" extension. 2. Please choose your font and plain or darkened inscription from the 2nd drop down menu. 3. 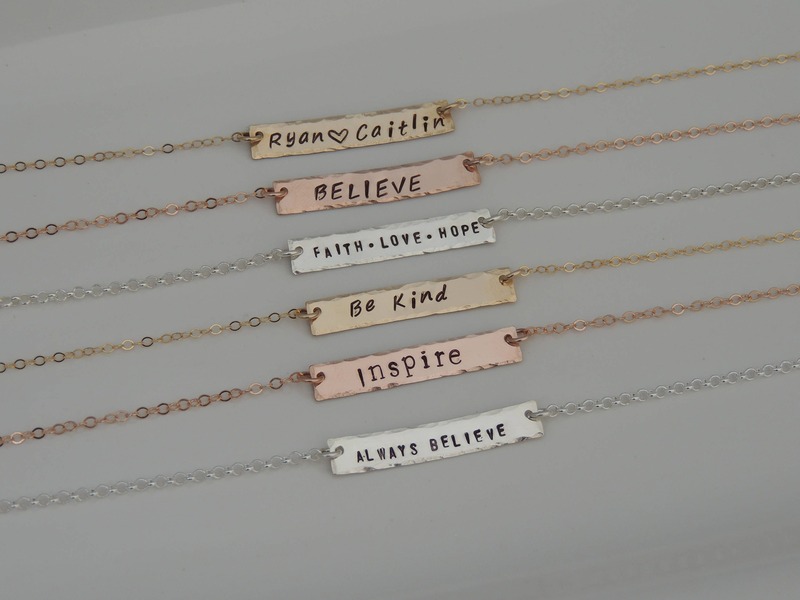 Please leave me a comment in the notes to seller section at checkout with the saying, names or dates you would like stamped on your necklace. * Please be sure to type your inscription exactly as you would like it stamped. ** Please also note in your message where you would like your inscription stamped (left side, centered, right side). Left and Right side options will correlate with your shoulders. For example, left side is left shoulder and right side is right shoulder when wearing the necklace. Please note the max characters I am able to stamp per font below. Thank you. All of my orders are packaged in a beautiful organza bag for gift giving. Also included is information on how to care for your jewelry and a FREE polishing tab. I stamp all items in my shop by hand one letter at a time. Items may vary slightly from the picture shown. I love to create custom pieces. If you are looking for something specific and do not see it in my shop, please convo me. For more jewelry designs, please visit my facebook page at https://www.facebook.com/CataniJewelry. I accept all credit cards via Etsy's credit card processing as well as paypal and Etsy gift cards. Payment should be made within 24 hours of purchase. 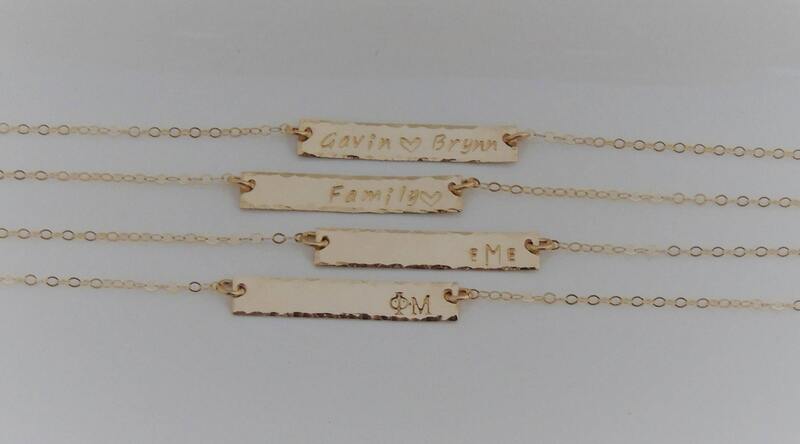 I am not able to start on any personalized jewelry until payment is received and cleared. Please note that if you are paying via your bank account on paypal, there is normally a 5-7 day delay for me to receive your payment. Thank you. 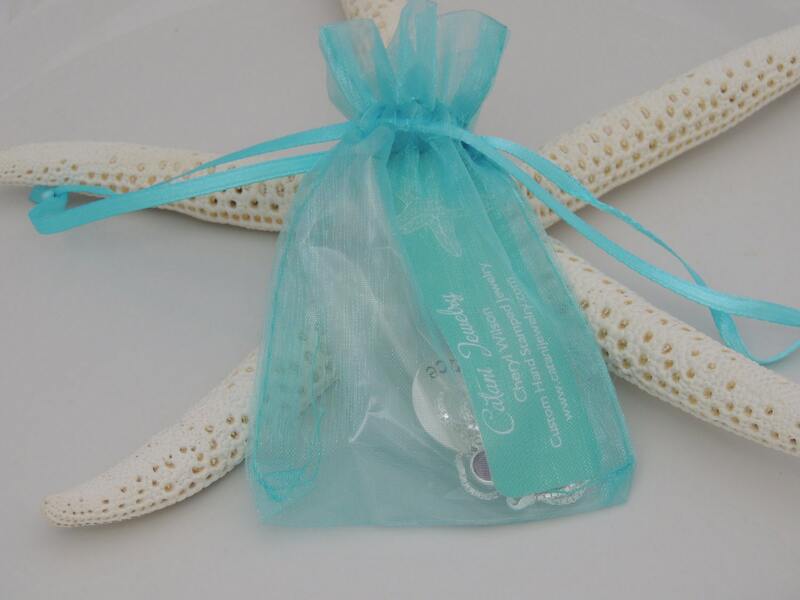 All items in my shop are packaged in a cute organza bag for gift giving. I mail all items in a bubble mailer to help protect your jewelry. My current production time is 3-5 business days. *Please note that the estimated shipping times listed are based on the USPS estimated shipping policies. Once your item is shipped the shipping times are out of my control. International order customers are responsible for knowing and paying your country's customs and duty charges when they are shipping from the USA. These charges are not included in your shipping charges through Etsy. Catani Jewelry is not responsible for these additional charges. Buyers are responsible for all return shipping costs. Sterling silver jewelry is not waterproof and will naturally tarnish, especially in humid conditions, exposure to air, soaps, perfumes, etc. We recommend removing your jewelry (especially rings) when showering, washing hands and swimming. 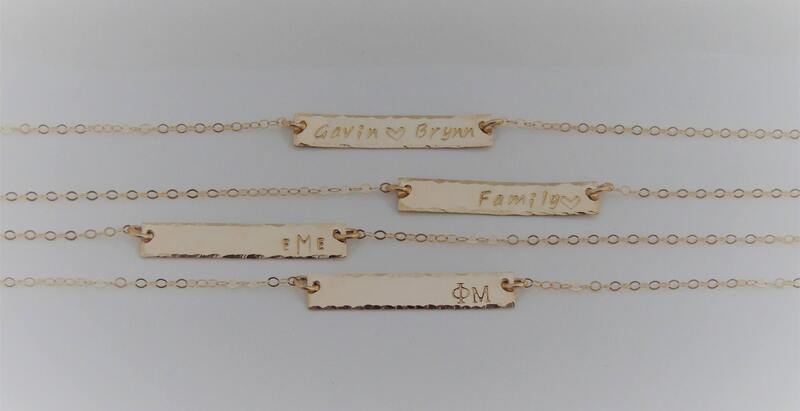 Water, soap, chlorine and other chemicals will remove the blackened lettering on your jewelry. Storing your jewelry in an airtight plastic baggie will also help it to not tarnish. The polish pad included in your package will clean your jewelry in a snap. More polish pads can be purchased by visiting my Etsy store (https://www.etsy.com/shop/CataniJewels).